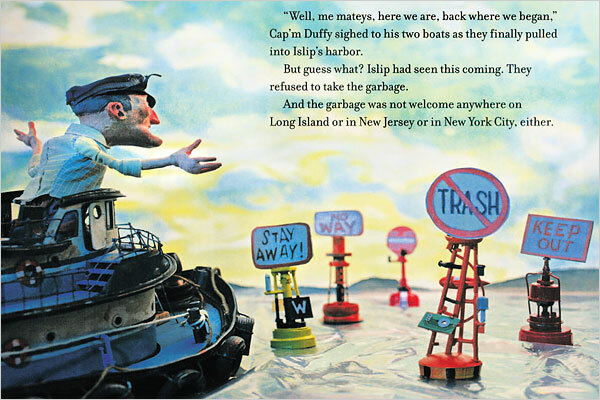 The New York Times book review’s 2010 pick for best illustrated children’s book is Here Comes the Garbage Barge! by Jonah Winter, illustrated by Red Nose Studio and published by Schwartz & Wade Books. The Times’ 2010 holiday gift guide slide show text efficiently sums the book up as “The story of a barge carrying 3,168 tons of garbage that couldn’t find a home — and how its ill-fated journey helped usher in the recycling era.” Can’t wait to read it. Here’s a link to the longer review with more on that true story, which we’ve mentioned here before. This entry was posted on Tuesday, November 9, 2010 at 8:28 am and is filed under Artistic Trash, Trash Politics. You can follow any responses to this entry through the RSS 2.0 feed. You can leave a response, or trackback from your own site. Love the illustration. We are a removals firm and trying to be greener and the amount of trash people throw away when moving house is horrendous. The illustration is a great way to show what is going to happen when we (the planet) has to much? launch it into space?? We neeed to reduce the waste we are creating.